Olympic Flash Games - Long Jump event. Rebrandable summer event games for licence. The Long Jump event is one of several Olympic field events that come instantly to mind, and with the upcoming 2012 Olympics in London there's the opportunity for a themed topical game. As with most real-life sports, there is plenty of space for branding/advertising. Game dDesign touches include the user's chance to choose and record their country flag along with their score,whilst the flag choice is also reflected in the crowd whilst playing. The game also has an in-built hi-score table showing the top 100 distances. Scoring down to three decimal places ensures that any game with a competition and prize attached will have a wide range of scores to be recorded, with bare millimetres possible between 1st and 2nd place. 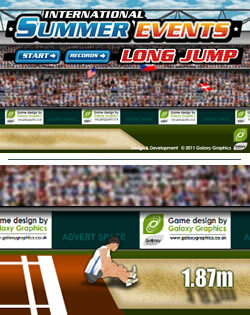 The Long Jump is one of four Olympic event games by Galaxy Graphics, comprising the sports : Javelin, Long Jump, Hammer Throw and Swimming. Flash Long Jump source code. Looking for Long Jump game source code / Actionscript 3.0 / .fla file ? The source code for this game is also available to buy from Galaxy Graphics. Click here to contact us about Long Jump source code.